The laundromat business is an established and still thriving industry. The concept of this business is simple and that is to provide an establishment equipped with commercial grade washing and drying machines for the customers' convenience. Little experience is required to start the laundromat business. However, any experience in running a business or marketing provides a great advantage towards making it a successful endeavor. Great importance must be placed on creating a detailed business plan before fully committing and investing your own money. This action will make you aware of such factors as: the sizable payments and loans needed to start, equipment needs, associated fees and how best to grow your business. This article will provide content that should be helpful in the development of your business plan. LegalZoom is a company that offers vital business formation services. Examples of their offerings are contents for obtaining a federal tax ID, a business license, permits, and information pertaining to the incorporation or set up of your business as a limited liability company. LegalZoom simplifies these processes and are great for small businesses. They will also help you have all the necessary applications and documents filed appropriately. It is important to keep up with the code compliance required by your city's rules and regulations. License and permit requirements and any associated fees will vary based on your location. In addition to LegalZoom, you could find information about the licenses and permits needed by using the U.S. Small Business Administration's website and talking to former or current laundromat owners. The following are items associated with the laundromat business. Fire department related permits - for installation of sprinklers and fire alarm systems. These permits and fees may have another name in your area. 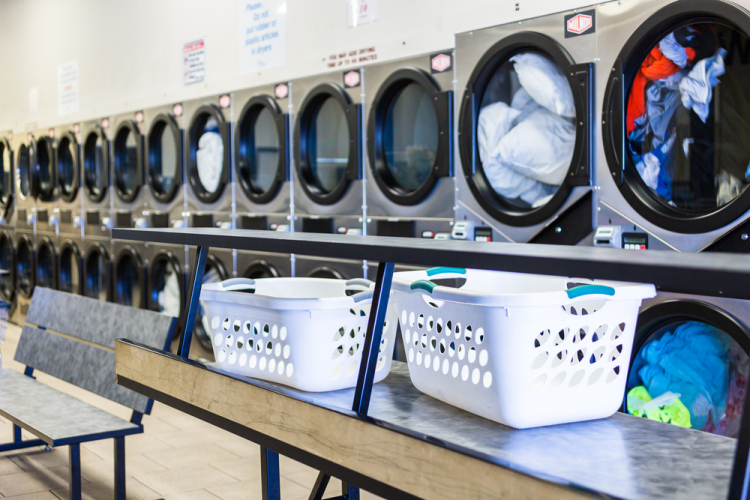 Some fees are not needed if you are purchasing an existing laundromat, such as the sewer connection fees, unless you plan to add more machines or update the place. Additional permits will be required based on extra services that you offer. For example, a food permit will be needed if you have a snack and/or drink vending machine. It is important to decide between buying an existing laundry service business or to start from scratch. The following will detail the differences between these choices. Based on your location. the installation of the washers could be very expensive due to the sewer connection fees. This fee is applicable to each connection added. Starting from scratch may require a higher cost due to the total fees and number of new equipment needed. Choosing this option means that you will need to negotiate with the current owner and determine a monetary value that works for both sides. Afterwards, your startup fees are dependent on any updates planned for the location. Therefore, you will only pay for the addition of new services and amenities. Some of the previously listed permits and associated fees are still needed, but fees like the connection to sewer fees could be waived. One thing to keep in mind before purchasing an existing laundromat is its reputation with current and previous customers. If it has a bad reputation previously, does this stain make it difficult to attract new customers and impossible to recruit the previous ones as well? *The rest of this article is mainly for those deciding to start from scratch. When looking for a prime location, you should look at populated areas or ones that are having high population growths. Find a commercial building or retail space near apartments and residential areas. Refrain from locations nearby existing laundromats. It is highly beneficial if the chosen location is convenient to get to by different methods of transportation. Determine the space needed to fit all the laundromat equipment and desired amenities. As you narrow down your rental space selections, you should factor in the building's condition and how much remodeling is necessary. Minimizing the renovation required will greatly lower the startup costs. Furthermore, you must consider the efforts required to keep the building up to code and being able to support all the dryers and washers running simultaneously. Decide whether you want to buy brand new machines or find existing ones for sale. Commercial strength equipment will need professional installation and should be an expense included in your projected budget. The subsequent sections consist of information on the different types of washers as well as amenities that could help your business stand out. Decide what type of washing machines to buy is an important decision to make early on. Each option will impact your startup cost and the space required differently. Of course, energy and water efficient machines is always ideal no matter what type is chosen. Top-load washers are the cheapest option. They have shorter wash cycles and their design offers consistent drainage without water or detergent being trap to induce any odors. However, top-load washers are not stackable and have longer drying time. New high efficiency top-loading washers have larger capacity and uses less water. However, these high-efficiency machines are more expensive than the traditional option and are still not stackable. Front-load washers are more expensive than top-load options. However, these types of machines are stackable, have large capacity, more energy efficient with reduction in water and detergent usage per load, and faster drying than the top-load washers. Therefore, the long-term benefits of reduction in water bills should outweigh the startup costs. If you decide on the front-load style washers, there are options to have a washer and dryer stacked upon each other as well. Stacked options allows for more efficient use of space. Alternatively, it is also common to have drying machines stacked upon each other as a single unit. While still being within budget, it is important to find a balance on the number of machines you could install at your location that would minimize the time customers spend waiting for a machine to be available. Based on your floor setup, plans and startup budget, choose which choice is best for your place. Mac-Gray is a company well-known in the commercial laundry system industry. They provide environmental-friendly and energy-efficient laundry equipment. Additionally, Mac-Gray also offer equipment servicing and could easily relay responses to local dispatcher to deal with service requests. Check them out and see if they are a suitable supplier for your laundromat needs. Coin operated laundromats have been the standard for a long time. However, it is becoming more normal for modern laundromats to have laundry machines with a card reader system installed. Additional items needed are a card dispensing machine and the cards themselves. Not only is this a convenient option for the customers, the card reader system could also track each unit's usage and make it easier to change the pricing. Chairs or benches for customers to wait on. Vending machine - the ability for customer to obtain snacks and drink. This will require a health department permit. Drop-off service - offering service to wash and fold clothes for customers could provide great convenience for those with hectic schedules that do not mind the extra expense. Entertainment options - TV or games to keep customers occupied as they wait. Security guard - the presence of a security guard during late hours will help the customer feel safe and prevent against vandalism. Of course, the additions of these items will increase your startup cost and/or monthly bill. Therefore, you will need to track and observer whether the profits from the provided services and those from recurring and new customers are surpassing these expenses. Another way to separate yourself from local laundromats is to offer more flexible business hours. One option is to have your location be open 24 hours a day as a self-service laundromat. This would be beneficial for those late night visitors, such as college students. Schedule cleaning tasks to occur before or after official hours. Otherwise, pick a time where not many customers are normally present. You should consider employing part-time workers to assist you in daily activities, such as cleaning and customer service duties, as well as cover for shifts when you are not present. Machine maintenance will require you to use independent contractor or companies like Mac-Gray mentioned previously. Otherwise, you could save money by taking the time to learn how to fix the washers and dryers yourself. Property and liability coverage for your laundromat is crucial to protect your business. The Coin Laundry Association has an insurance program with coverage specific for laundry businesses. In addition to the daily task of managing your laundromat, marketing is an essential part of running your business. Creating a profile on websites like Google My Business is a great way to have your business information available online and easily searchable. Creating profiles on user review websites will help catch the attention of those that like to read comments and reviews before stepping into any local businesses. Commonly used review website platforms are Yelp, Facebook and Google. It is standard to have a basic website that contains relevant business information, such as phone number, address, business hours, etc. Do not forget to take this opportunity to design an appealing website that lists any extra services or amenities offered at your laundromat. GoDaddy and Squarespace are common choices to create a professional-looking website. The following software will greatly reduce the time dedicated to administrative tasks and the headaches that comes with it. Furthermore, they reduce the amount of paperwork needed, prevent errors associated with expenses and payrolls, and keep track of critical information. Gusto is a software product that automates payroll and tax filings as well as keeps track of employees work hours and paid time offs. Check out FreshBooks to see if this cloud-based accounting software meets your bookkeeping needs. Relevant features that comes with FreshBooks are the ability to easily track your expenses as well as receipts, keep notes on financially related communications with vendors, and the storage of these information online.